Owners Nicole and Donna Rea both attribute their ability to grow to development of their employees and getting more organized processes in place. They are hoping to grow by 35 percent in 2018. Caring Transitions, America’s largest resource for managing senior relocations as well as downsizing and estate liquidations, is pleased to announce that Caring Transitions North Dallas Suburbs has been awarded one of the company’s national Top 10 Awards. 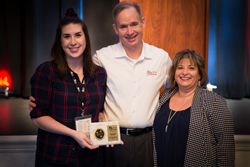 The franchise is locally owned and operated by Donna Rea and Nicole Rea and the award was presented at the company’s national conference on February 9, 2018. Caring Transitions Chief Operating Officer Al Scobell said the Top 10 was competitive this year and he’s excited the Reas had such an awesome year. “This mother and daughter team meet every challenge and opportunity head on, driving their office to the number two spot in the entire Caring Transitions System. Donna and Nicole have a clear vision of where they want their business to go and a strong plan on how to get there. They have focused much of their energy on building their team, putting processes into place and growing relationships, which has definitely helped them grow their business. We’re excited that they made the Top 10 for 2017,” Scobell said. Caring Transitions is a national franchise in more than 200 markets. Caring Transitions North Dallas Suburbs’ specially-trained team can handle organizing, packing, de-cluttering, moving, resettling, in-person and online estate sales, liquidations and preparing homes for market. Caring Transitions specializes in managing senior relocations, but the services are also perfect for busy families and individuals in need of assistance. Caring Transitions North Dallas Suburbs serves Allen, Fairview, Lucas, McKinney, Richardson, Plano, Dallas and surrounding areas. “Being recognized as one of the Top 10 franchises in the country is an honor and we are always excited at the chance to recognize our team for their tremendous efforts. We are nothing without the wonderful people we have working with us and we owe all of our success to them. This award is really about the work they are out doing on the front lines every day,” Nicole said. Nicole and Donna both attribute their ability to grow to development of their employees and getting more organized processes in place. They are hoping to grow by 35 percent in 2018. “In 2017 as the business matured, our focus was primarily on systems and processes. We streamlined so much by implementing policies and procedures and making sure hiring and onboarding were done more effectively, which, in turn, has greatly improved employee retention,” Donna said. “We also took a new approach to teambuilding. Our team is with us because they want to serve and use their hands to make a real difference. We want to make sure they know they are valued and appreciated. We’ve started holding quarterly staff meetings – always with something fun – to bring everyone together to talk about the business, what’s working and what needs work. Since we began consistent meetings and teambuilding sessions, our team feels stronger all around,” Nicole added. As for business development, the Reas are working hard to make sure Caring Transitions is a household name throughout Dallas. This year, their focus is on creating a cohesive sales and marketing program as well as adding additional staff members to the team. Caring Transitions North Dallas Suburbs is bonded and insured and all W2 employees have been background-checked. For additional information about Caring Transitions North Dallas Suburbs, call (214)504-1650, email DRea(at)CaringTransitions.net or NRea(at)CaringTransitions.net, or visit http://www.CaringTransitionsNorthDallasSuburbs.com.